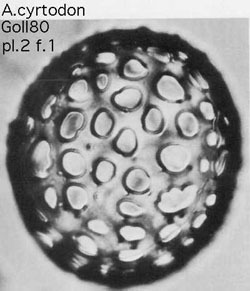 Shell spherical or subspherical, with numerous roundish pores of very irregular size and distribution, mostly larger than the bars. Ten to twelve pores on the half meridian of the shell. Between them a variable number (mostly six to nine) of large roundish pores, about half as broad as the shell radius, armed on one side of the margin with one single large tooth, about as long as the diameter of the aperture, hook-like, curved, and obliquely laid over them. Dimensions: Diamter of the shell 0.12 to 0.14, of the pores 0.01 to 0.025, of the bars 0.003 to 0.006, of the larger apertutres 0.03 to 0.04.